Were those ancient digital cameras really unusable? I found this quick photo of Elton John and was pleasantly surprised at the capabilities of the "primitive" camera. Andy Roddick started a foundation, and what better way to kick off a new foundation than to invite a friend like Elton John to come to Austin, Texas to do a fundraising concert at the Four Season Hotel? 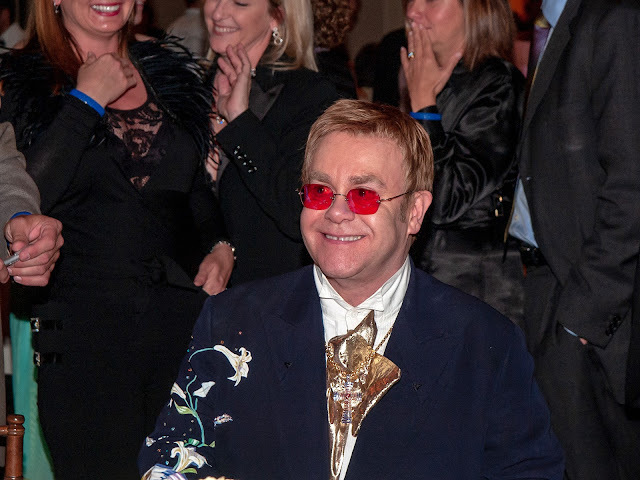 I was asked to come along and take photos of Sir Elton John with Andy, and his friends and family, (not for public display) and also to cover the dinner and concert for the 250 people attending. Of course, I would love to be able to send back a couple of current cameras in a time machine so my younger and handsomer self could make great use of those ISO "invariant" Sony sensors everyone seems to gush about. But I can't currently afford even a Sears time machine so I'll just have to be happy that the images came out, were well used, and assisted the Foundation with their fundraising goals. Sometimes you just have to use the camera you have on hand. Waiting for the future is too expensive.